Physical chastisement inflicted as legal punishment. Corporal punishment is one of the oldest forms of chastisement known to the law. The method of its infliction according to Jewish law differs from that of other penal codes, inasmuch as the former law carefully guards the convict from cruelty and excessive pain, stating expressly (Deut. xxv. 3), if the judge sentenced the wicked to be beaten a certain number of times, according to his fault, "Forty stripes he may give him, and not exceed; lest if he should exceed, and beat him above these with many stripes, then thy brother should seem vile unto thee." Upon this passage the Rabbis comment, saying: "The wicked is thy brother still" (Sifre 286; Mak. 22). The Talmudic law provides that whenever the infliction of corporal punishment is ordained, it is peremptory, and allows no discretion to the judge (Maimonides, "Yad," Sanh. xvi. 1), except in regard to the number of blows. Three judges must be present at the beating (ib. xvi. 2); one of them ordering the blows to be administered; the second counting them; and the third reading the verses Deut. xxviii. 58, 59, as an accompaniment (ib. xvi. 11). The punishment was inflicted by the beadle of the congregation, and the law recommends that the man chosen for this purpose shall be stronger in mind than in body, so that he may not strike too hard or upon a dangerous or weak spot (ib. xvi. 9; Mak. 23). The convict was tied to a post by his hands, his back and breast bared, and the beadle stood behind him, a fourfold thong of leather in hand. He was then bent forward and the lashes administered, one stroke on the breast and one on each shoulder alternately (Macc. iii. 12; "Yad," Sanh. xvi. 8-10). The maximum number of blows was thirty-nine (compare Mak. iii. 10, 22b with LXX. to Deut. xxv. 3, which reads , "about the number of forty)." One less than the Biblical number of blows was given, in order to prevent the possibility of a mistake in giving one more than the lawful number. When the convict was found by medical examination to be physically unable to receive the full number of blows according to the sentence of court, he was given a smaller number, always a multiple of three ("Yad," Sanh. xvii. 1, 2). 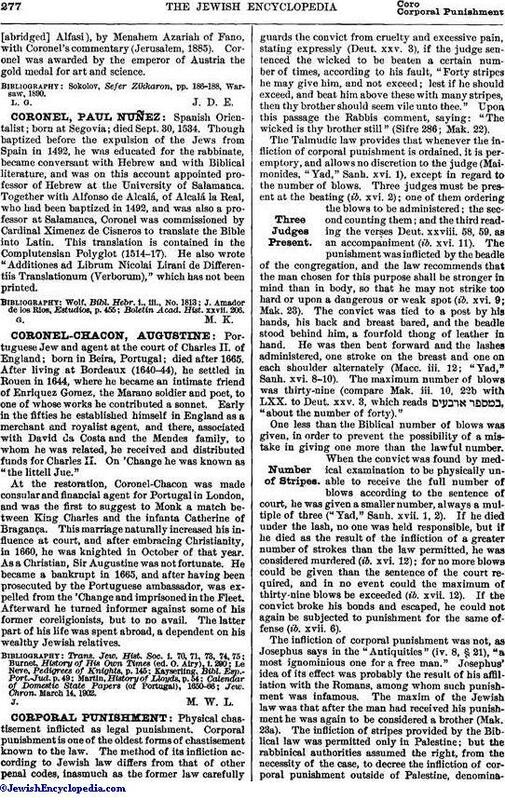 If he died under the lash, no one was held responsible, but if he died as the result of the infliction of a greater number of strokes than the law permitted, he was considered murdered (ib. xvi. 12); for no more blows could be given than the sentence of the court required, and in no event could the maximum of thirty-nine blows be exceeded (ib. xvii. 12). If the convict broke his bonds and escaped, he could not again be subjected to punishment for the same offense (ib. xvii. 6). The infliction of corporal punishment was not, as Josephus says in the "Antiquities" (iv. 8, § 21), "a most ignominious one for a free man." Josephus' idea of its effect was probably the result of his affiliation with the Romans, among whom such punishment was infamous. The maxim of the Jewish law was that after the man had received his punishment he was again to be considered a brother (Mak. 23a). 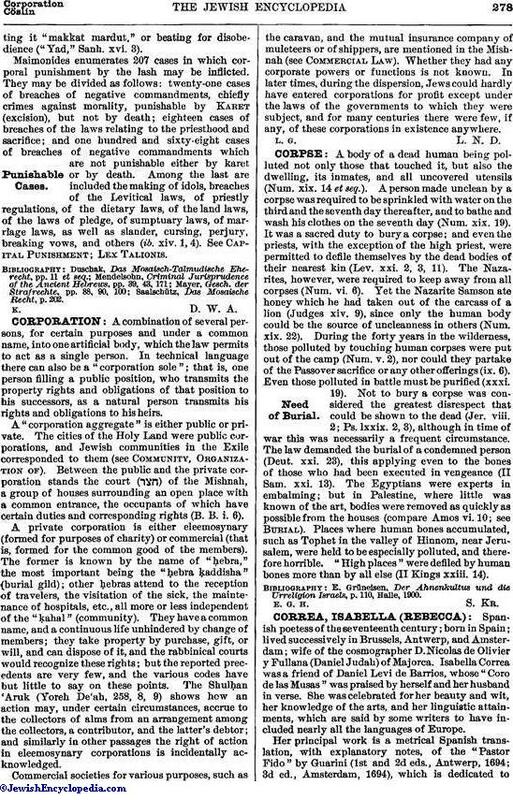 The infliction of stripes provided by the Biblical law was permitted only in Palestine; but the rabbinical authorities assumed the right, from the necessity of the case, to decree the infliction of corporal punishment outside of Palestine, denominatingit "makkat mardut," or beating for disobedience ("Yad," Sanh. xvi. 3). Maimonides enumerates 207 cases in which corporal punishment by the lash may be inflicted. They may be divided as follows: twenty-one cases of breaches of negative commandments, chiefly crimes against morality, punishable by Karet (excision), but not by death; eighteen cases of breaches of the laws relating to the priesthood and sacrifice; and one hundred and sixty-eight cases of breaches of negative commandments which are not punishable either by karet or by death. Among the last are included the making of idols, breaches of the Levitical laws, of priestly regulations, of the dietary laws, of the land laws, of the laws of pledge, of sumptuary laws, of marriage laws, as well as slander, cursing, perjury, breaking vows, and others (ib. xiv. 1, 4). See Capital Punishment; Lex Talionis. Saalschütz, Das Mosaische Recht, p. 202.